Brief Description: John Davis, born April 30th 1976 in London England, came to America at the age of 24 when the economy in England suffered a recession. He fell into a bad spot and had a great deal of difficulty making ends meet. His house fell into disrepair and became infested with roaches, which began his severe dislike of insects, especially roaches. He spent the last of his money exterminating the roaches but then was broke, and finding employment in England had become all but impossible. Seeing no other option, he took out a loan from the bank and travelled overseas to America, where he enlisted for Police Training. Thankfully, training was already paid for and he more than met the requirements; within a few months of training he was made an officer for the American half of the city of New York. He served there for five years, his trustworthy and respectful nature bought him a friendship with many other officers, including his own chief, and his cautiousness and organizational abilities made him a respected police officer himself. Despite the many debts he still had to pay, which made his home life somewhat difficult, John always did his job unquestioningly and very efficiently. Five years into his career, he was offered a promotion to the Special Victims Unit. Knowing the raise would help with his debts and his skills would still be put to good use, John accepted the promotion, and was transferred to the SVU. There, he met Jacob Corleone, a detective for the Unit even at that time. John was made Jacob's partner and was personally trained by him as well. There were a couple of instances where John made terrible mistakes and felt absolutely humiliated, which brought a temporary depression. But Jacob's kind, caring and understanding nature always got John right back on his feet, which developed a friendship between the two rather than just a co-worker or student-to-teacher relationship. Of course, for the first few years of working together, John never actually knew that his partner was bisexual, even though it was apparent from how Jacob spoke to some of the other officers of the unit; despite Jacob's flirty nature he never figured it out. Eventually, John found out, albeit by accident when he followed Jacob home to give him some work he'd forgotten back at the office. And that's when John saw Jacob's husband, Kre'ul. For a while John became rather distant from his partner, and it didn't take long for Jacob to notice. The two had a long discussion together, and came to an understanding. 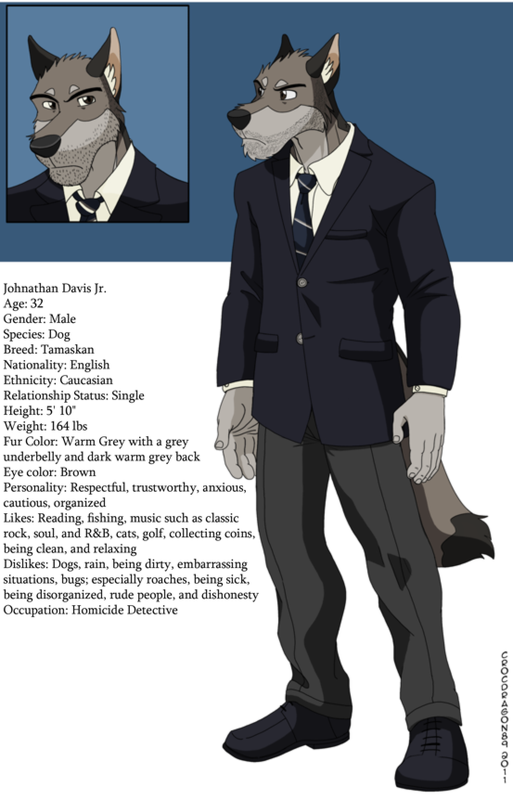 Eventually, John made it to the same rank as Jacob in the SVU; Detective. But the two continue working together. John still works hard to pay off debts but remains a member of the SVU, respected, valued and honored among all of his colleagues. Side note: My anthros are different. I treat them as actual human beings. They're basically humans that happen to look like walking, talking animals. They own pets like anyone else and they grow facial hair just like anyone else. I treat their fur as if it were skin. They refer to each other as man or woman, boy or girl, not by species. Just thought I'd add that in.